With a busy schedule, I can’t always water the lawn when I’d like. It’s hard to give it enough water on a regular basis. But I found the perfect solution: The Best Water Timer. The timer automatically takes care of watering the lawn when I can’t. It saves water because it only runs for as long as I need. I can program it and forget about it. The one I chose for my home fits between my garden hose and the outdoor faucet. First, I’d like to tell you more about my digital watering timer, then describe my other top two choices. I hope that you’ll find the one that works best for your home, too. When I first began to research a timed watering system for my yard, I liked the idea of a hose faucet timer. I don’t have in-ground sprinklers, nor am I ready to invest in them yet, hence the Orbit is my best choice. If you have sprinklers, check out the Rain Bird timer reviewed below. The Orbit 62061N-91213 Single-Dial Water Timer attaches to the faucet and one hose. It’s water-resistant so you don’t need to worry about drips or rain damaging it. It works nicely with my wall-mounted garden hose reel. To protect the timer, I placed it on the feeder hose leading from the faucet to the reel. That keeps it safe from sudden yanks on the garden hose. Programming it only takes two minutes. Just turn the dial and use the +/- buttons to set the time, the watering intervals, and the length of time it waters. All the information displays on the LCD screen, which is large and very easy to read. Orbit says that the two AA alkaline batteries it needs should last up to 4,000 on/off cycles, so it’s very economical to use. If a single hose timer isn’t enough for your needs, Orbit also sells two-outlet and three-outlet digital timers. The Orbit timers are covered by a 6-year warranty. Although the Orbit 62061N-91213 timer is the best one for my home, I looked at other options you might like. Next, I’d like to tell you about an analog timer from a company called Raindrip. Instead of an LCD display, the Raindrip R675CT Analog Water Timer has three dials that control its functions. Set the frequency of watering and the run time when you turn the dial. For example, you can select 20 minutes of watering every two days, or 60 minutes once a week. The timer’s first dial (not the top one) offers watering frequency intervals of 1 hour, 2 hours, 3, 4, 6, and 8 hours. You could water new sod every four hours, for example. Then it skips to 12 hours, 24 hours, 48, and 72 hours, or one week. The Raindrip gives you a little more flexibility than the Orbit timer. The second dial controls the run time. Here is where the Orbit beats the Raindrip. The Raindrip has a maximum runtime of only 120 minutes. It also has fewer choices. You’re limited to 3, 5, 10, 15 minutes at a time, and so on. Realistically, it may not matter to you if you can water for only 30 minutes instead of 35. Like the Orbit timer, the Raindrip has both a rain delay and a manual setting. Those are located on the top dial. It also offers another convenient feature. It warns you when the battery is getting low. This is an important benefit because if the AA batteries die, the water won’t shut off. 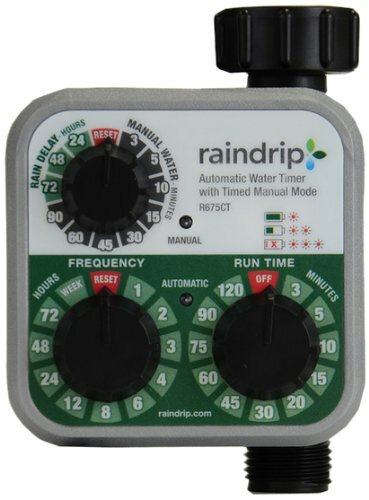 Raindrip says you can attach their timer to outdoor faucets, garden hoses, or drip tubing. It comes with a universal fitting for maximum compatibility. There are a couple of downfalls to this timer. One, since it is analog, you’ll have to consider ahead of time when you want to program it. For example, if you would like it to water your lawn every other day at 4 am, you’ll have to program it the first time at 4 am. That was one of the reasons I chose the Orbit over the Raindrip. Two, there have been several complaints that the Raindrip consumes batteries rapidly. This is unfortunate since a dead battery leaves the water running without shutting off. I didn’t want to risk that happening in my yard. If you happen to have a large lawn or want flexibility in how you water some plants or areas, check out the 4 zones programmable sprinkler timer described below. If I had an in-ground sprinkler system, it would be my top choice. 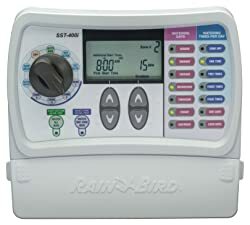 The Rain Bird SST400I Indoor Timer is a great upgrade for older sprinkler systems, or an excellent investment if you’ve just put your new system in the ground. Let’s say you have a shaded area at the side of your home that has been getting too much water while the front part of your lawn is too dry. Maybe your flower beds need more or less water than these areas. With the Rain Bird timer, you can select different watering intervals for each part of your yard. The SST400I can handle up to four zones, but Rain Bird also sells 6-zone (check price) and 9-zone (check price) models. If it rains, you can set the sprinkler to delay watering. There is also an option for seasonal adjustments. One button touch tells it to water more in the summer or less in the spring or fall. If you just laid new sod and need some extra watering, use the manual mode to temporarily override the regular schedule. Just remember to reset the dial to automatic when you’re done. The timer can water up to four times a day. The Rain Bird timer doesn’t need batteries because it runs off household current. It saves all settings to permanent memory so it doesn’t lose them even if the power goes out. It’s also sealed against moisture and dust, although it is made to be mounted inside a garage or home, not outside. I will tell you how did I find my water timer. I liked the Orbit digital timer the best because it is extremely easy to program and use. There’s no guesswork, and I don’t have to get up in the middle of the night to set it for the first use. Although I planned to stick to a regular watering schedule, I also wanted some flexibility for unforeseen circumstances. I didn’t want to have to remove the timer from the faucet just to use the hose for a simple task. The fact that all of these timers offer manual mode and the rain delay was sufficient flexibility for me. None of these timers are very expensive, but I still wanted one that was durable. I didn’t want to worry about water or heat damaging it, or have to replace batteries frequently. I’d like to recap here what I liked best about each one of these three timers. The Orbit 62061N-91213 Single-Dial Water Timer is the one I chose for my home. It’s been very easy to use and saves me time and money on water bills. The LCD screen makes it clear what I’m programming. The timer offers a lot of flexibility and precision for how long and how often I water. If your watering needs can be met with just one hose, take a look at the other two watering timers in this review. Both attach to a single outdoor faucet and are very easy to use. The Orbit 62061N-91213 digital timer is my top choice because it has the best precision and flexibility for scheduling. The Raindrip R675CT Analog Water Timer isn’t as precise as the Orbit, but it’s very easy to program. It offers rain delay and manual override. If you prefer an analog timer with three simple dials for programming it, consider the Raindrip R675CT Analog Water Timer. The Rain Bird SST400I Simple to Set Indoor Sprinkler Timer would be my top choice if I had an in-ground sprinkler system. It’s also very simple to program. The best part is that you can control watering times for 4 different areas of your yard. If you have an in-ground sprinkler system, or plan to put one in, consider getting the Rain Bird SST400I Simple to Set Indoor Sprinkler Timer. This one is nice because you can set different watering times for four different sections of your lawn or garden. I hope this buyer’s guide helps you choose the best water timer for your yard. The digital timer from Orbit has saved me a lot of trouble and money. My lawn looks healthier because it gets watered regularly. Even if I leave the house early, the job still gets done. A timer on the hose gives me lots of flexibility and it’s very inexpensive. I can move the hose or the sprinkler wherever I need it to water. The timer takes care of the rest. When we had drought restrictions, it gave me precise control over running the sprinklers so I didn’t waste precious resources. Also, when it rains, I can delay the next watering for 1, 2, or 3 days. For example, in the summer, I have my timer set to water every three days for 30 minutes each time. If it rains, I can hit the plus button to hold off on watering for up to three days. 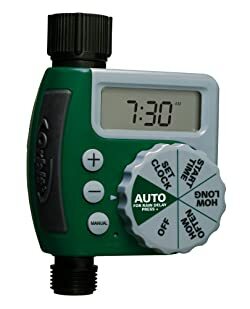 If I need to water outside of the schedule, I can turn the dial to “manual” and set the amount of time it runs up to 240 minutes. It will still remember my schedule when I switch it back. I can set it and forget it.